A girl and a man have died in a four-vehicle collision on the A9 near Dalwhinnie in the Cairngorms, police have confirmed. Three others, including another girl and a woman, were hurt in the incident at about 0920 BST on Saturday. Northern Constabulary said the crash involved a 4x4 towing a caravan, a car and two vans. The road was closed for several hours and diversions put in place while the crash scene was investigated. The girl was pronounced dead at the scene and the man was airlifted to Raigmore Hospital, where he later died. A spokeswoman for Highlands and Islands Fire and Rescue Service said cutting equipment was used to free one of the casualties. Ch Insp Donald Henderson, of Northern Constabulary, said: "This was a serious and tragic incident. "My thanks to the officers and emergency services personnel who attended such a difficult scene. "We would like to offer our condolences to the families concerned." 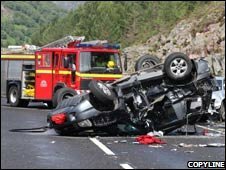 The deaths bring the number of lives lost on roads in the north of Scotland in the last two weeks to eight.